Image slides are a basic slide type included in Meta Slider (free) and Meta Slider Pro. An image slide will simply display an image with a caption. You can optionally link the slide to a URL of your choice. Click the ‘Add Slide’ button to launch the Media Manager and select ‘Image’ from the left. 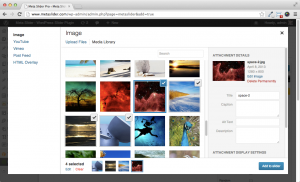 From here, you can either upload new images or select existing images from your Media Library to use as slides. Tip: Hold down CTRL to select multiple images. Click the Add To Slider button. The Media Manager will close and the slides will be loaded into your slideshow. A spinning disc will show next to the ‘Save & Preview’ button while this process is happening. The general tab lets you define the slide caption and URL. Check the ‘New Window’ box to force the link to open in a new browser window when clicked. Your slides will be cropped to match the size specified in your slideshow settings. By default the largest, most central area of the image will be cropped. If you find the wrong part of your slide is being cropped (for example, the image is of a person and their head is being cropped out of the slide), you can choose to crop a different area of the image.